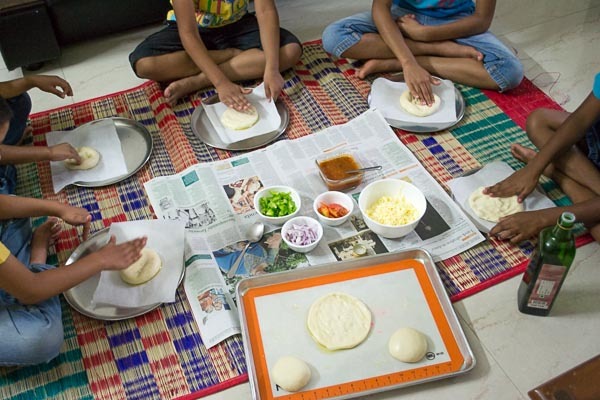 Mini Pizza Party for children with Dough from Scratch. 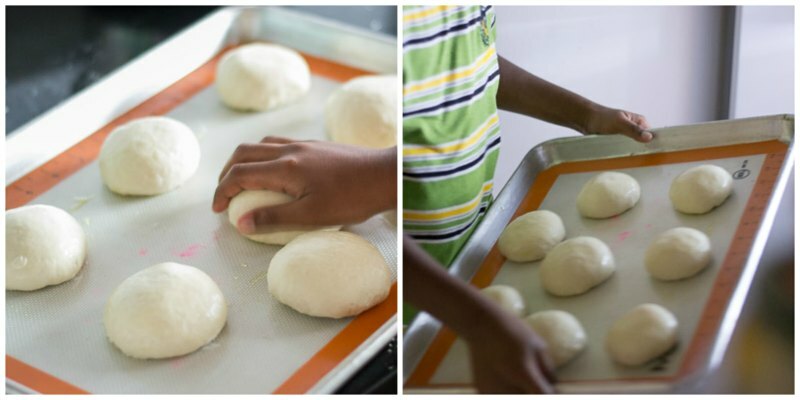 Great recipe for making mini pizzas where the children can roll out the dough and bake it themselves. A very forgiving dough which works well every single time. Simple ingredients. No overnight resting required. 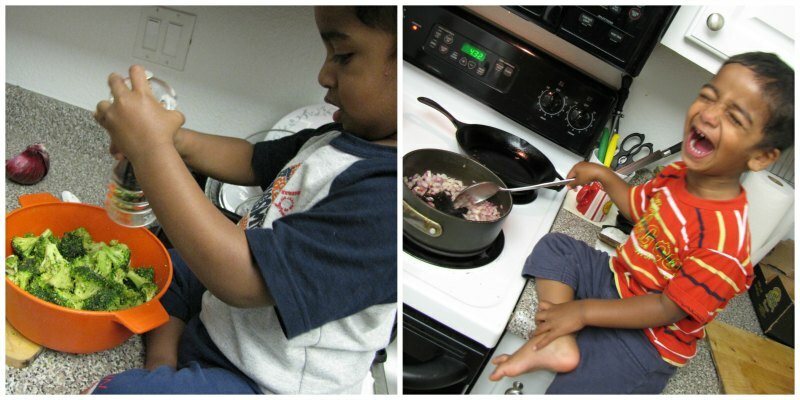 Getting the children early in the kitchen is the only way to get them interested in food. My father made my son sit on the kitchen counter and gave him a real knife when he was four. I was scared but he just asked me to let it go. He told he would take care. He did. My father would say, you got to believe the kids. We actually do not know what they are capable of doing because we are scared and over protective and never willing to give them a chance. Starting them early is very very essential. We had a lot of fun making this pizza from scratch with the children. This is a very very forgiving pizza dough recipe which can be made the same day. No overnight resting is needed. I have made it several times with the kids and they all love to get their hands doughy and saucy and would lick the plates clean. Lets get some flour love. Shall we? First step, weigh and measure all the ingredients. In a big bowl, add in 420 grams – 3 cups all purpose flour and 1 1/2 teaspoon salt. In a separate bowl mix a tablespoon of olive oil , 1/4 cup water and 3/4 cup milk. Second step, lets get the yeast working. Take a small bowl and add 1/4 teaspoon of sugar and 2 teaspoon Active dry yeast. Add in 1/4 cup tepid water. Mix well and leave it aside for 5 minutes so it becomes foamy. Indian yeast is temperamental. If it doesn’t foam, discard and start again with a fresh batch of yeast. Combine all the ingredients (flour mixture, milk mixture and yeast mixture ) together and form a dough. The dough will be very soft. We are not trying to knead yet. We are just combining everything together. Once its mixed, move away for 10 minutes. Don’t do anything. It hydrates the dough and it becomes a lot easier later to knead. Now start kneading. I did it by hand for a good 5 minutes. The trick in kneading is to avoid the temptation of adding flour. Too much flour alters the moisture content and will result in a dry dough. So do not add too much flour while kneading. Knead well until the dough becomes one soft ball. Take a lot of help from the little master kneaders. First Rise : Once kneading is done, shape the dough into a nice smooth ball and transfer the dough to a well oiled bowl and let the dough rise until doubled. Mine took two hours. 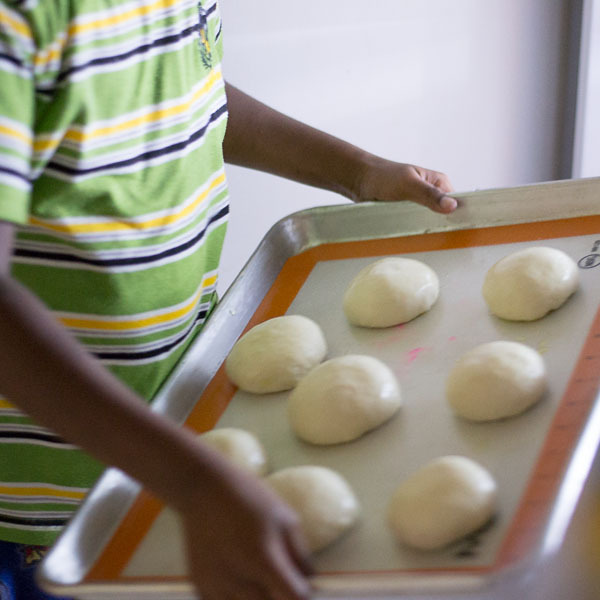 Second Rise : Check every half hour with your little one to see how the dough is getting fat. You will be impressed. Once the dough is doubled, transfer the dough to a work surface. punch the dough down, make a ball and let it rise again until doubled. Another 2 hours. It can be faster or slower depending upon where you live. Third rise : Turn the risen dough to your work surface and cut the dough into 8 equal pieces. Flatten the dough and start crimping the dough as shown in the picture below to form 8 nice smooth balls. Lightly oil all the balls and let it rise for half hour before baking. If you are not going to use it right away, refrigerate for up to 6 hours. Let it come to room temperature before proceeding. Preheat the oven to 400 degrees F. Flatten each ball to disks on a parchment paper. Press it in shape as necessary with your fingers. Top it with tomato sauce and toppings of your choice and place it on a sheet pan. Bake for 10-15 minutes. For a children’s party, hand over a parchment paper and a dough ball to each kid and let them flatten and put the toppings of their choice. Mark a small initial on the corner of the parchment for identification. Have a great party with loads of fun. In a big bowl add in the all purpose flour and salt. In a seperate bowl mix a tablespoon of olive oil , ¼ cup water and ¾ cup milk. 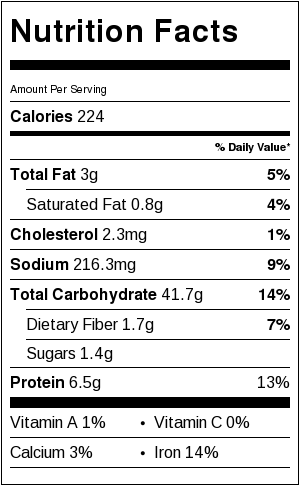 Take a small bowl and add ¼ teaspoon of sugar and 2 teaspoon Active dry yeast. Add in ¼ cup tepid water. Mix well and leave it aside for 5 minutes so it becomes foamy. Combine all the ingredients together and form a dough. Once combined rest for 10 minutes. Knead well for 5 minutes until the dough becomes one soft ball. Second Rise : Once the dough is doubled, transfer the dough to a work surface. punch the dough down, make a ball and let it rise again until doubled. Another 2 hours. It can be faster or slower depending on where you live. Third rise: Turn the dough to your work surface and cut the dough into 8 equal pieces. Flatten the dough and start crimping the dough to form a nice smooth ball. Lightly oil all the balls and let it rise for half hour before baking. If you are not going to use it right away, refrigerate for upto 6 hours. Let it come to room temperature before proceeding. Baking: Preheat the oven to 400 degrees F. Flatten each ball to disks. Press it in shape as necessary with your fingers. Top it with tomato sauce and toppings of your choice and bake for 10-15 minutes. Hi Suguna, I want to try making this recipe with my 6 year old daughter over this weekend. Just wanted to clarify the measurements used here. I normally use the standard cup i.e. 1 cup=250 gms to weigh out ingredients that specify cups. The recipe given by you is 3 cups=420 gms. If I go by your measurement, how many gms/mls. will I need for milk and water accordingly ?. Many thanks. Works like a charm! Have started preparing the dough around 5PM and was able to make it for dinner @ 9PM.. And the base turned out soft and crisp in the sides. Thank you for the recipe. hi, The recipe is simply superb!I my search ends here!!!! thanku so much. be used to make a bigger one — if so pl give me the baking timing. long and again a third time for 1/2 hr? Thanks Maria. The pizza becomes easily digestible after the long time and also the taste is far better. Yes you may use to make a big pizza. Wow! Lovely kids. Nice to see kids having fun and learning cooking tips from you . Iam sure you would have had a wonderful time with them. Happy new year Guna. Thank you so much! Wish you and your family a very happy new year too Sreekanth!